Why is your smile healthier than your dog’s? I often wonder: Why is that? How is it that we feel our own teeth need a twice-a-year tune up (once a year at a minimum) at the dentist office but teeth cleaning pets once every year or two seems laughable? It pains me to say this but the disparities between human and pet dental care do not stop there. Below is some food for thought – some comparisons, if you will – on the way we care for our own teeth and how we don’t care for our pet’s teeth. 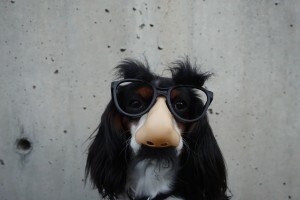 Don’t let the disguise fool you – dogs and people require the same sort of maintenance on their teeth to keep them in good shape ! I am going to go out on a limb here but I assume you brush your own teeth at least once (twice? three times?) daily (thumbs up for you if you floss too!). Now here’s the question you knew I would ask: How many times per day do you brush your dog’s teeth? For most people that answer is zero. Imagine how disgusting your mouth would get after one week of not brushing. No offence, but your breath would be horrendous! Now imagine one year. Now imagine your entire life. Gross! Dog’s teeth are just like ours and need regular brushing at home in order to prevent bacteria from ‘setting up shop’. 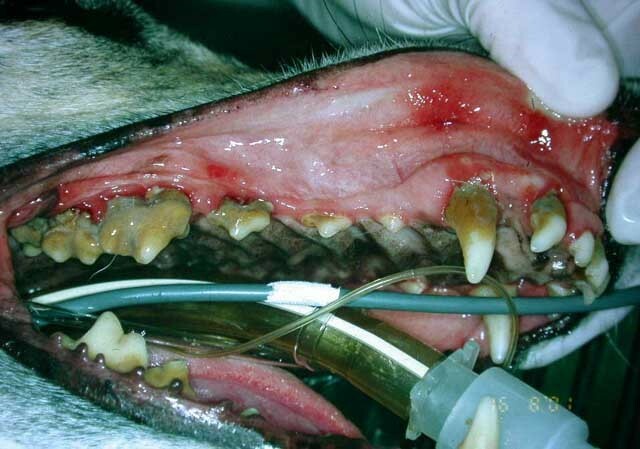 The Bottom Line: Brush you’re dogs teeth daily or expect to deal with dental problems later in your pets life. I often hear clients say to me, “We don’t brush his/her teeth but we feed a dry food so that keeps their teeth clean”. Unfortunately it’s not that simple. The average pet food has the same texture as an oatmeal cookie. Imagine if your kids stopped brushing and instead just ate a few oatmeal cookies each morning – ew! I guarantee their dentist would not be pleased at their next visit. The Bottom Line: Your dog’s food needs to be a prescription-grade food with dental claims on the label (supported by scientific studies, VOHC approved) in order for it to truly help keep their mouth in good shape. Regular pet-store brand kibble will not keep your dog’s mouth healthy for long. Imagine there are two next-door neighbours with similar homes on your street. Neighbour A is very tidy and cleans their house from top to bottom 1-2x per week. Neighbour B is a complete and utter slob who hasn’t cleaned at all for 5 years. If they both want to have their homes deep cleaned by a professional cleaning service, which do you think is going to pay more? Of course it’s neighbour B! The same principle goes for our pet’s mouths- without regular maintenance (ie brushing, dental diets) the amount of work the vet has to do increases exponentially. And more work = more $$$. If you brush your dog’s teeth regularly at home, having their teeth cleaned once every 1-2 years would cost the same (or even less!) than the average person spends on their own dental bills. The Bottom Line: Regular maintenance means cheaper vet bills. Ignoring your pet’s oral hygiene is very expensive. “Just a quick clean up for me this year, doc”. Think again ! This mouth has been neglected for years and will take several hours (and cost thousands) to repair. So if you’re thinking “WE GET IT DOC. We are going to start brushing TODAY”, then good for you! Need some pointers on how to do it? Click HERE for our how-to video on brushing your dog’s teeth. Want more info? 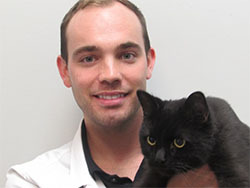 I highly recommend you check out Dr. Fraser Hale (board certified veterinary dentist) and his wonderful website for tips on home dental care. An Oral health assessment is part of your pet’s Annual Health Exam. We will discuss dental home care individualized for your pet and /or if your pet requires a professional dental cleaning.